The White House said President Barack Obama and Cuba’s President Raul Castro’s handshake at Nelson Mandela’s memorial service was unplanned. White House aide Ben Rhodes told reporters the two exchanged no words more substantive than a greeting. 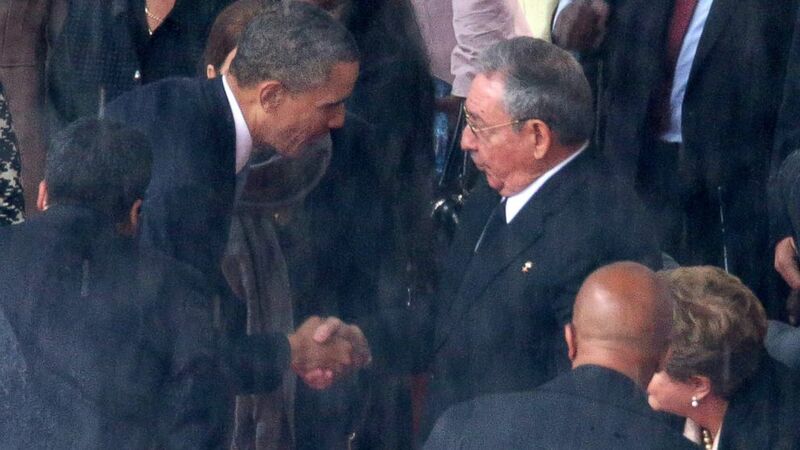 The Cuban government said the gesture may show the “beginning of the end of the US aggressions”. The US broke off diplomatic ties with Cuba in 1961 as Fidel Castro aligned with the Soviet Union in the Cold War. On Tuesday, after the handshake, a White House official said the Obama administration still had grave concerns about human rights violations in Cuba, Reuters reported. Republicans on Capitol Hill were quick to condemn the gesture, with one Republican congresswoman chiding the move during a unrelated hearing on Tuesday. “Sometimes a handshake is just a handshake, but when the leader of the free world shakes the bloody hand of a ruthless dictator like Raul Castro, it becomes a propaganda coup for the tyrant,” Florida Congresswoman Ileana Ros-Lehtinen, who is known for her opposition to the Castro government, told Secretary of State John Kerry. The last US president to shake a Cuban leader’s hand was President Bill Clinton, who greeted President Fidel Castro, Raul’s brother and predecessor, at a 2000 UN General Assembly meeting. Under President Barack Obama, the US has eased restrictions on Cuban-Americans travelling to the island and on remittances between family members across the two countries. But the gradual thaw has been disrupted by the detention in Cuba of a US contractor. Alan Gross, 64, was arrested four years ago while on a project to provide internet access to Cuba’s small Jewish community. On the fourth anniversary of his arrest, Alan Gross wrote to Barack Obama to say he feared the US government had “abandoned” him, and asked the US president to intervene personally to help win his release.